Anyone who reads my blog knows I have a soft spot in my heart for Tangled. It’s actually the film that got me interested in animation again. I was so turned off by the films like Chicken Little and Shrek the 3rd that I had stopped going to animated films. Many people say the trailers for Tangled are awful. I really couldn’t tell you because I didn’t’ care about animated movies in 2010. Then my little sister (18 years younger) wanted to see it so I decided to see it and was blown away. Particularly the 3D and the lanterns was awe inspiring. I also loved how funny it was and Mother Gothel immediately became a favorite villain. 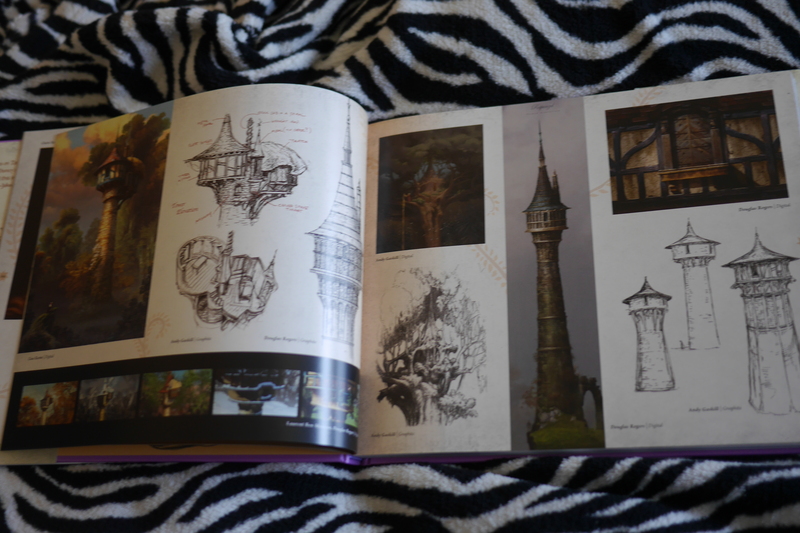 So, naturally I had to get the art book when it came out and it is a really cool one with a very unique approach. 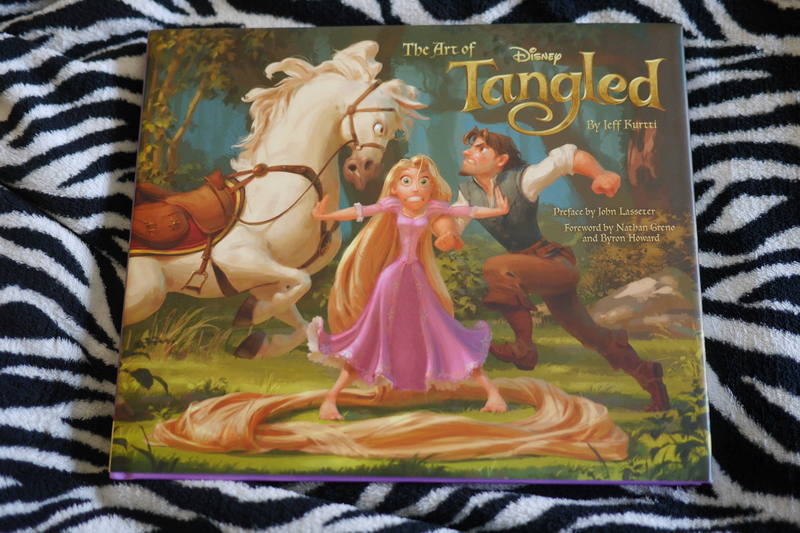 In his Preface John Lasseter reminds the reader that Tangled was Disney’s first computer-animated fairytale adventure. It’s easy to forget that these days. He talks about the challenges they had making the movie and applying the source material to a modern audience. In fact, that is a theme of this art book. It’s about the new technology and all the old history and Disney tradition that made Tangled work. 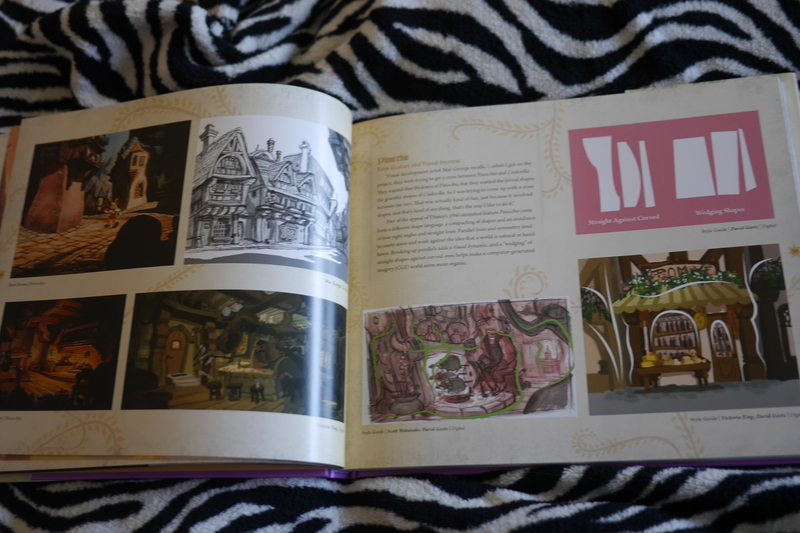 We start out getting the history of the Rapunzel story and the many incantations it took over the years at Disney. 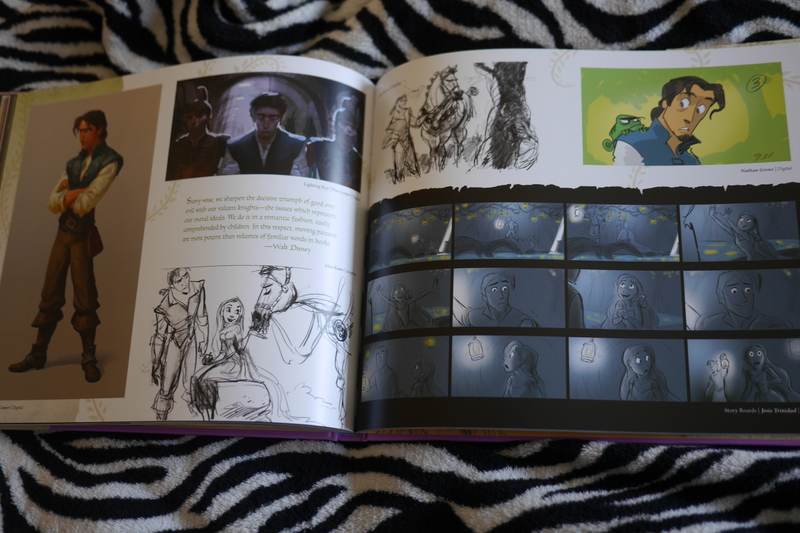 The sketches are so interesting and a side of me wishes we could have seen those films as well! They eventually had to scrap everything and start again bringing on Byron Howard and Nathan Greno. What’s really cool then is they go through the ‘artistic inspirations- seeking to touch a cultural memory’. We then see what the filmmakers learned from Sleeping Beauty, Cinderella, Pinocchio and Disneyland Park. This even comes down to the ‘signature shapes’ of each movie. 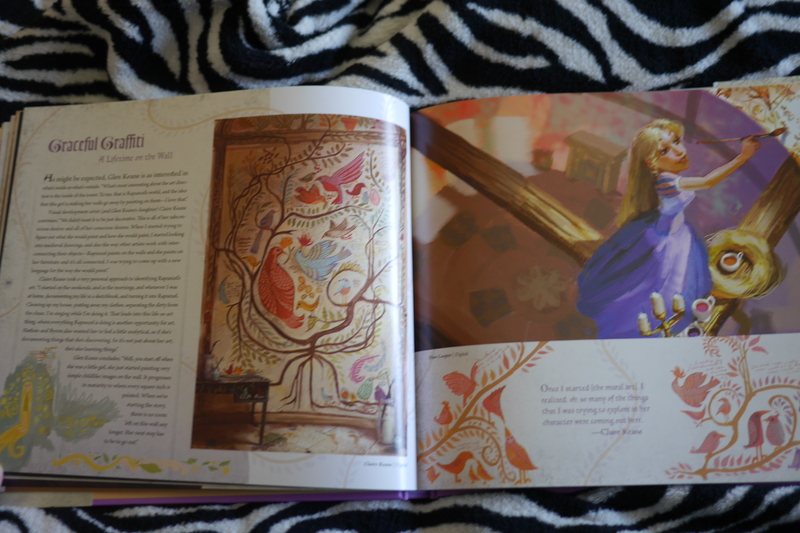 I also love a section called ‘Graceful Graffiti’ where they talk about the process that went into Rapunzel’s paintings and artwork on her walls. 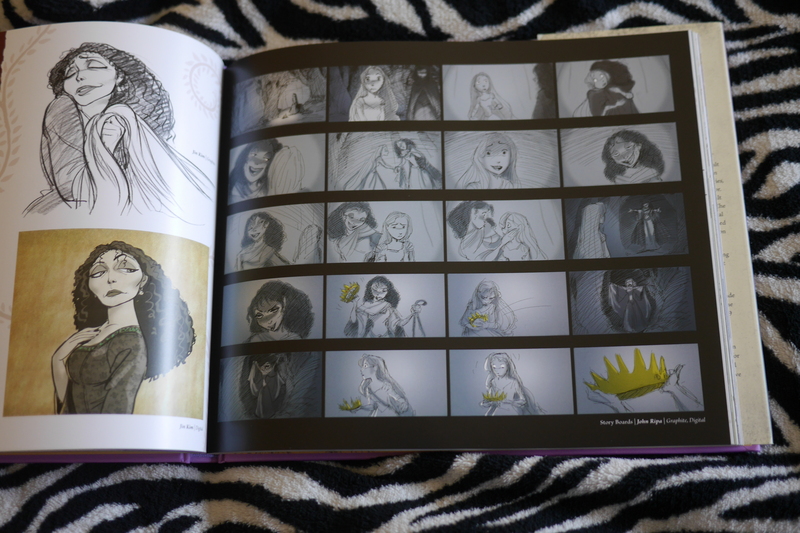 We learn more about Rapunzel or the ‘elevated prisoner’ ias they call her in a chapter called The Tower and find out everything down to the hair brushes used to inspire the film. The same is true for all the characters including Mother Gothel. Next is The Forest, Snuggly Duckling and the Kingdom. The amount of detail about each location and character is outstanding and I love the way they keep tying it back to the history of Disney animation. It’s fascinating. And of course we get a segment on the lantern sequence; although I would have been interested to learn more about creating their first 3D film. I think this quote from art designer Doug Rogers sums up the attitude of the film and art book “You want to give audiences back something that they had- or something that they heard that other people had…Working for Disney you need to give 110% because the public expects this from Disney. They’re used to quality from Disney. It’s always in the back of your mind, that’s what I’m going for, that’s why I’m working here, that’s why I like it, and let’s make sure that we get the best”. For those of us that love animation how great is that to hear! 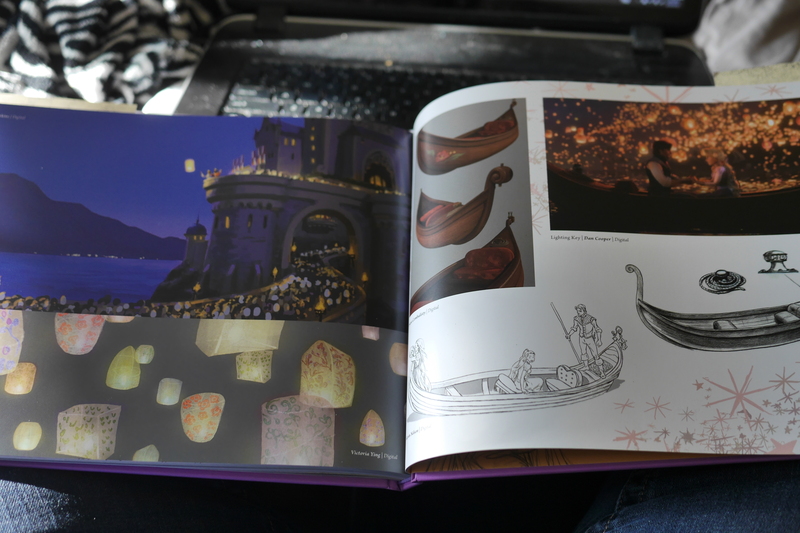 So I highly recommend checking out The Art of Tangled and enjoying the best that Disney can offer! I didn’t know that you gave up on animation pre-Tangled? I guess it’s like The Princess and the Frog to me: TPATF was the movie that made me pick a side as to whether I prefer hand-drawn animation or CG. I was always neutral before that. What was your opinion on animation, in general, before Tangled? Like were you always a fervent supporter of it like you are not before you started to lose faith?